Inner Peaks South End will close at 7pm this Saturday, April 27th for Ladies Night. All females are welcome at Ladies Night from 7-9pm. Two Charlotte locations. One great community. 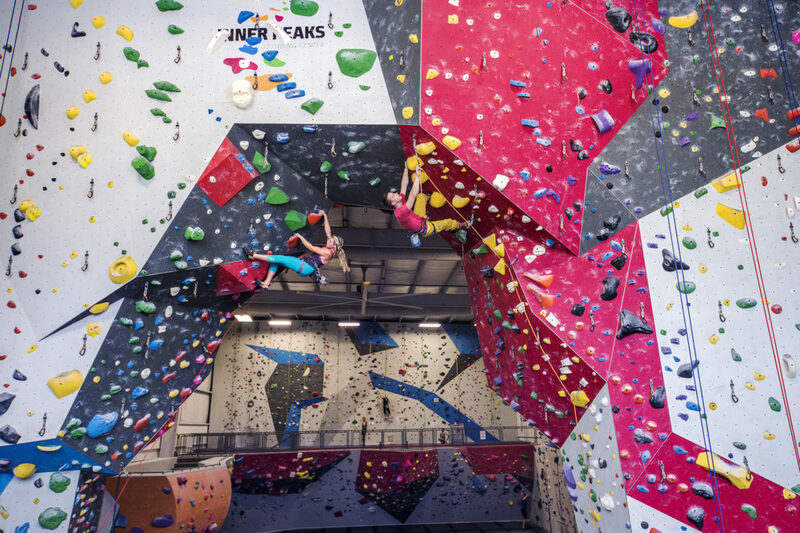 With two state-of-the-art rock climbing facilities in the Charlotte area, Inner Peaks provides an environment that can help you stay fit, reduce stress, build focus, meet people and just have a great time. Ditch the traditional gym and come join us today! Even with zero climbing experience, you can have fun here. You’ve climbed many times and want to challenge yourself. Children ages 5 and up can visit our gym and have a fantastic time. Staying fit is essential for climbers. Check out our yoga classes and fitness equipment at both locations. Climbing is a perfect outing for friends or team-building activity. Our customers are the most important to us. No matter your level, we are here to support your journey. and get your seventh month of membership FREE! Household memberships for families are also available! First time climbing…ever?! Don’t worry – we’ve got you covered. We have the gear, the instructors, the terrain and the ability to get your climbing in as little as 15 minutes. Our First Timer package includes everything you need to go from curious to hooked in no time. We also suggest wearing comfortable, form fitting clothes and closed-toe-shoes. Top that off with a smile and a good attitude and you’ll be set! Climbing is for everyone – what are you waiting for? Great place to climb. I feel comfortable here and I like the routes – they are challenging. Staff is great! Great place to release all your stress. Excellent service and very good equipment. You can enjoy on your own, or with a group of friends. I definitely will come back again. Great place to spend some time having fun climbing. Even when crowded, all the climbers were courteous and everyone was able to climb. A wide variety of routes for varying skill levels. Such a fun evening and a great workout! Inexpensive, well-maintained, and an exciting space. My girlfriends and I decided to try Inner Peaks and the service was top notch, the staff was friendly, knowledgeable and helpful, and the facility was easy to navigate. We will come back and definitely recommend to all our friends and family! My friend and I had a phenomenal time at Inner Peaks yesterday. The staff was friendly and made it the best first experience ever!! I’ll definitely recommend it to someone else. Visited for the holiday with family. This was a great family trip with a range from age 9 to 40’s! The staff was great about tutorials and help with anything. The walls offered a very wide range of difficulty as well! The staff was very nice and informative. There were plenty of courses to do alone or with friends. Once we went through the waivers, the staff was hands off, which I really liked. I never felt rushed or pressured while there. It was a great workout! © 2019 Inner Peaks. All Rights Reserved.